The 27 metre motor yacht Sea Lion II, listed for sale by Simon Turner at Camper & Nicholsons, is sold with Marine Marketing introducing the buyer. Built in GRP by Italian yard Arno, she was delivered in 2005 as one of the yard's Leopard series and has had just two owners since new. She features a bright and airy interior with a modern design and contemporary fittings. Sea Lion II accommodates up to nine guests in four cabins consisting of a full beam master suite, a large VIP suite plus a double and a twin with a Pullman berth. All cabins have full en suite facilities and audio/visual systems. Exterior areas are generous and feature a large open aft deck and a forepeak with cushions which are perfect spots for lounging in the sun. Indoors, the large windows in the upper saloon and an electric retractable roof offer the interior a feeling of space as well as great views. There is an additional cozy lounging area below deck with an LCD television screen. Meanwhile, twin 2,180hp MTU engines linked to Arneson surface drives give her an exhilerating cruising speed of 38 knots. 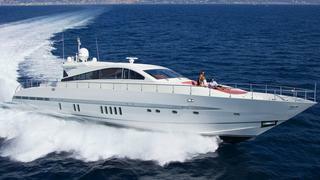 She also offers an excellent charter history, having been based in the eastern Mediterranean for the past few seasons. Sea Lion II was asking €1.2 million.